I had also been told of his wonderful predictions of the weather to come – of how on one occasion when in Kirriemuir he took home with him provisions to last him six weeks, at the same time informing some of his Kirrie friends that he was doing so as a heavy snow-fall was to take place, so that he would not get back until the end of that time for more – and that this prophecy came true and added yet another bright jewel to his already well-adorned crown of fame. “Rashiebog” was an old man, or I should say a man well up in years, before l was born, and he was upwards of fourscore until I had the pleasure of making his acquaintance at his own little homestead in Glenquiech. It was on a day in the first week of the glorious month of August. The weather was magniﬁcent, the heather was in full bloom, and the sweet fragrance which the soft western wind blow from it was both refreshing and delicious. The small thatched “clay biggin”’ in which our philosopher dwelt, homely and rude as it was, yet, as seen in the bright sunshine of this lovely August morning, was far more picturesque than many a ﬁner dwelling. A few dozen hens of the black Spanish breed were clucking, clucking around the front, and only, door, picking up scraps for their breakfast. Sandy Campbell, who was not confined to any “crue,” but could take a dander at his own free will over the hills, was at the present time engaged eating a hearty meal from a big “trough” set at the end of the dwelling-house. The old man told me afterwards that this pig was on the hills all day, and always returned to his meals just as regular as if he had been a hired servant. “Dauvit” was sitting on a low stone bench in front of the cottage, very busy making “tattie creels” with long saugh wands that grew in the burn near-by. The reader can see the exact ﬁgure I saw in our Portrait – the same coat, the same hat, set on the back of his head, for, like other great men that I have known, old Dauvid Ogilvy, so far as the adornment of his person was concerned, had only one suit for Sunday and Saturday and all the other days of the week. Greatness of mind and foppery do not often go together, although strange to say sometimes they do. In the course of that summer in which I first visited old Rashiebog, I had many an interview with the old gentleman. He told me all about his family, that he was now the only representive of the Rashiebog Ogilvys alive; that they were descended from Baron Ogilvy of Lintrathen and Alyth, and were, therefore, scions of the Ogilvie’s of the “Bonnie Hoose of Airlie.” David’s mother, besides, was one of the Royal House of Stewart, so that the blood of kings ran in our old philosopher’s veins. The want of space necessitates that I should close this present sketch. At some future time I will return to the subject, and give more in detail the facts connected with the strange life-history of the wonderful old man, for he really was one of the curiosities of the nineteenth century. This remarkable character passed away to a brighter and better land on the 12th of January 1892, in the 96th year of his hale, ripe old age. My bairnheed’s beinly, winsome hame! fair be yer fa! In a beautiful little glen away among the Braes o Angus, nestling on the eastern slope of Benscravie, sits the above habitation. “Sit Ma Lane” is no the name of this wee biggin’. No, it is “Rashie bog.” It is one hundred and three years since thee hoary old boulders before you were sent rolling down the steeps o’ Benscravie, the Saddle o’ and Naked Tam, where they had been squatting, if not since antediluvian times, at least from the age of Noah’s “big dub” to form the biding-place of one of Scotland’s most intelligent and, to some extent, obscure sons of her soil. “Maistlin since the days o’ Adam” it has been in the hands of the Ogilvys, but about the beginning of this century Lord Airlie sold Downie Park, a portion of lands including Rashie. It is interesting to relate regarding the purchase of this small estate and the subsequent demise of its purchaser, as it forms a link to our present sketch. one of Scotland’s most intelligent and, to some extent, obscure sons of her soil. Towards the “back end” of last century, William Rattray, a scion of Corb Castle, above Blairgowrie, set out for India. He joined the East India Company’s Bengal Service, and rose to the rank of colonel. When he set out, his father, the laird of Corb, was only able to hand him ten pounds as a nucleus for his fortune. When there he married an Indian lady, by whom he had two daughters. On amassing “his fortune” he resolved to return home. His wife and one of the daughters died before reaching this country. After their return the Colonel and his brother wished to buy back their ancestral estates, which had been confiscated or broken up in 1745, but this was not to be. One of the brothers purchased the estate of Arthurstone, near Coupar. Angus, and William bought the lands of Downie Park, near Cortachy, for £16,000. There was no house at this time. After the purchase was completed, he declared, “It is paid now, but God knows how it was won,” and said, “If I get any honest man’s son to marry my daughter, I will give her the lands of Downie and all the money.” She, however, predeceased the father. 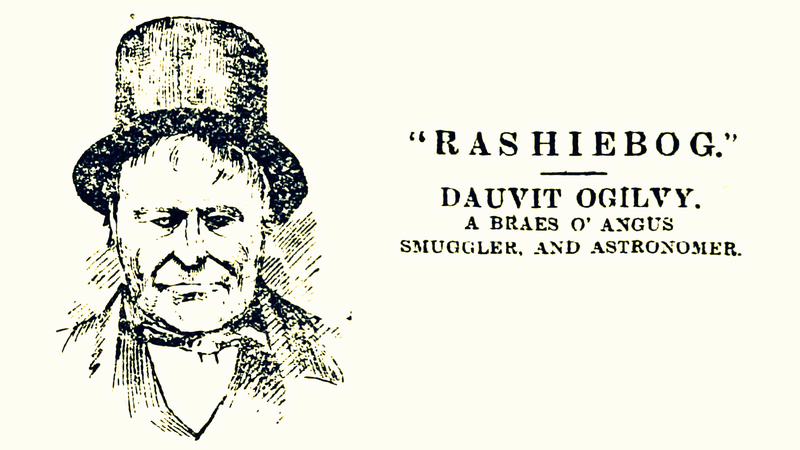 The present tenant of Rashie—Dauvit Ogilvy maintains that it is quite easily enough knowing how it was won. “It wis by killin’ fouk an’ takin’ their property and money oot o’ their pockets in the East Indies.” Some time after the acquiring of Downie, a mansion was built, and in the year 1819 the gallant Colonel designed to have a porch for the main entrance to complete the mansion, but before it was finished he died. He was buried in a green sward near the confluence of the Prosen and Esk. This was expected to be the last resting-place of the old soldier, but no. One day there raged “among the braes” a terrific thunderstorm, accompanied by torrents of rain, which swelled the rivers and overflowed their banks, and washed out part of the grave. Strange thoughts seized the minds of the people in the district. Was there an Indian mystery connected therewith? This, however, was not allowed to be the last nor the second last resting-place of the warrior. Fearing a renewal of the angry elements, they disinterred the remains, and had them interred in the churchyard of Kirriemuir. Yet another disinterment and interment. After a rest here of twenty-five years this grave was also opened and the remains, enclosed in a new coffin, were removed and deposited in the north-west, corner of the Old Howff of Dundee. Dauvit Ogilvie was at the first burial of his laird, and helped, he being a pall-bearer, to lay him in the grave by the aid of “pleugh reins,” as the cords were not strong enough for the weight of the heavy coffin. The old Colonel’s last will and testament ran, thus – “That after all my relations who can claim, connection with my family, these lands shall go to anyone in Scotland of the name of Rattray.” Before the estate could be sold it was necessary to bring in a bill into Parliament to reduce the terms of the will. On the missive being broken the estate was sold. Downie Park Mansion and part of the lands attain fell to Lord Airlie – but that portion in Glenquiech was secured by Mr John Ogilvy of Inshewan, Rashie’s present laird, and likewise a minor branch of the Ogilvy clan. On the sneck o’ the door of the above dwelling “1785” stands out in bold relief. This house was built by Dauvit’s uncle. At that date there were only two or three houses or shielin’s in the Glen. When the family came there was just a vast barren, wilderness, and nothing but black heather and mosses to be seen. That house was built without either plumb “or “spirit level,” just by the sicht o’ the e’e. The fireplace was first in the middle o’ the floor, and the reek went where it best could, but principally by a hole i’th’ roof. There is no “coom ceilin’” here, just the thack with a lot o’ “thin’ins” abune and below with tufts o’ girse,” broom, and general vegetation on the ootsidc, a’ helpin’ to mak’ it wind and water tight a lum whaur a lum sud be. There is no grate, just the hearthstane, with a crook suspended low enough oot o’ the lum to allow the kettle to rest on the log and peat fire. Although the bit hoosie is auld and reekit, it is quite snug and “bein.” The barn is on the west side of the house, and the stable, byre, and his joiner’s shop on the east. The henhoose and cartshed and others on the south complete the farm steadin’, and are all built from boulders and stones, some of them over a ton in weight. All the lintels, “rybats,” and uprights are from the neighbouring hills, and of the plug and feather.” The whole of the fences on thirty acres of land are all whin bouts, and were made into dry stane dykes by Dauvit’s ane hands. Besides building all his own steading, he in his time has built nearly all the houses and steadings in the Glen. GENEALOGY AND THE AGE OF CHIVALRY. It is yet a disputed fact between two ancient families in Angusshire whether this is the land of the Lindsays or the Ogilvys. We will not stay to decide the contention. At all events the Ogilvys claim to have been in possession o’ the Braes o’ Angus “maistlin since the days o’ Adam.” The Ogilvys are descended from one of the seven great hereditary chiefs of Scotland. The first ancestor was Dubican, who at one time held sway over all that part of fertile country from the North Esk to the River Tay. He died in the year 939. It is not our province to travel over the whole ancestors of him who is our subject in the present sketch, but he can go as far back as to trace the root of that mighty and historical tree of which he was a twig to that of Dubican. From Dubican came Gilchrist, contemporarily with Malcolm Canmore, first Earl of Angus. But we will pass over a century or two, and get to our immediate and interesting descendant of this Ogilvy clan. In the year 1411 Sir Alexander Ogilvy, the then Sheriff of Angusshire and his son George were both killed in the battle of Harlaw. George’s wife was then staying at Cardach, near the Loch of Lintrathen. This lady and her family, on the death of her husband, removed to Lethnot, in Water Esk, near Glenclova. Lethnot was bought at this time for this family by the then Laird of Clova (an Ogilvy) from a “fule body” for £10 in advance. The family spread through the country, and Dauvit’s forebears were descended from her eldest son. The Rashiebog Ogilvys are therefore of ancient origin and of noble descent, they being descended from Baron Ogilvy of Lintrathen and Alyth, hence they are scions of the “bonnie House o’ Arlie.” In 1680 Dauvit’s great-grandfather held lands and grazings in Lintrathen, being a large farmer and grazier, and thereafter held the farm and grazings of Braedownie, in Glenclova. The present “Rashie” holds receipts for that farm dated 1699. On the termination of the lease, they could not agree about certain clauses in a new lease, and his great-grandfather got indignant and set out for Deeside. When leaving, Lord Airlie said -“Heat has sent ye awa’, but cauld will bring ye back again.” They, however, crossed the Capel Month and sojourned for a while with their friend, Stewart of Ballatrick. Not being contented in Deeside, Lord Airlie’s words came true – back they came – re-crossing the Capel, and took the farm of Gella, also in Water Esk. It would have been very interesting had a family record been kept of this ancient family, seeing that they were duniwassals, or head me in the Clan Ogilvy. We can fancy them marching, in the front rank of the Ogilvy crusade to storm and burn Castle Campbell, in revenge for the burning of “the bonnie noose o’ Airlie.” Again, we can picture them following their chief to join the gallant Earl of Mar; and, in later days, following the brave Lord Ogilvy to given the ranks of Prince Charlie, and, like many a noble clansman, sealing their loyalty with their blood on Culloden’s fatal field. The Braes o’ Angus afford many sub-jects of interest to inquirers, whether in archaeology or social economy. In no other part of Scotland, for the space of a century, can it be more distinctly traced, Down to the Rebellion of 1745, this country was in a sad state of barbarism, and on all the baronies the hereditary jurisdictions were maintained ‘in partial operation till within a very short time of their abolition. The feudal system was perpetuated in the habits of the people, the tenantry slavishly following their lairds. Kirriemuir and Forfar and other burghs were generally under the influence of their powerful neighbours. It was from the Braes o’ Angus that Lord Ogilvy’s horses, which did such good service for Prince Charlie, were recruited. Times changed then, as now, and the Jacobite cause became Jacobin. The change was most rapid. In Forfar, where in 1745 the Stuarts were so strenuously and so enthusiastically supported in 1782 the Bible was publicly burned by the then sympathisers of the French Revolution. The scene is changed! The sons of the troopers of my Lord Ogilvy became the Radical weavers of Kirriemuir. The strained relations of parties resulted in manufactures and trade succeeding to marauders and men-at-arms. Since then the current of events has carried all before it, and makes the county of Angus now stand at the head of the linen and jute trades of the world. DAUVIT’S BIRTH AND PARENTAGE etc. David’s father was brought up at Auchoillly, Deeside. His mother was of the royal house of Steuart. “At Gella, Water Eak, Kirriemuir, on the 22nd November, 1796, the wife of David Ogilvy, farmer, of a son (David).” Is it not strange for a Man to read his own birth 92 years after he was born? But here it is in the Weekly News on the 1st December, 18,88, Dauvit reading it himself with an eye as clear as the best-sighted reader among the 195,316 of its subscribers. At the time of Dauvit’s birth his father, besides being a farmer, was the only tailor in Wateresk. He made “slacks ” and waistcoats for the men and gowns for the women. It did not matter how he did this work ; whether he “eat near the door” or not he only received payment in kind, by having his land tilled and other work performed by his customers. 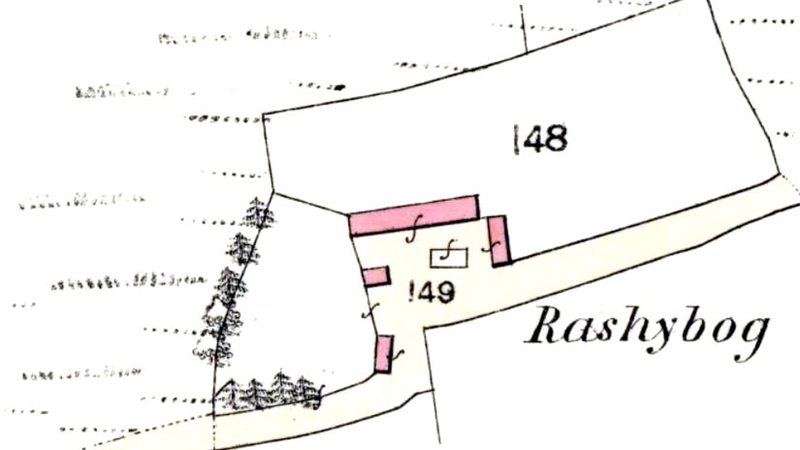 In 1805 the family came to Rashiebog. David was then eight years old. The stocking when they entered consisted of 20 ewes, 2 cattle, and a horse beast. The rent paid by the previous tenant was £2 for a 100 Scotch acres, including pasture lands. The Ogilvys gave £9 for it the first lease, the second £15, third £19 and latterly it was a yearly bargain at £30 per annum. During all these years the Ogilvys built, fenced, drained, and improved the farm from 8 acres to 31 acres solely at their own expense, except £30 at one time allowed them by Mr Ogilvy of Inshewan. The present laird. Some Ten years ago Dauvit retired from farming, and Rashiebog is now joined to Horniehaugh, at a rental of £40. Mr Ogilvy now allows his old tenant the “houses” and five acres of land at a rental of £5, and at the same time a reduction of 100 per cent. The stockin’ at Dauvit’s now consists of “crummie,” Sandy Cam’el, and a stirk, and two or three hens. At the time he gave up his farm, ten years ago, the staig, a piebald mare, “Bell,” died at the age of thirty-three years, and some time previous the foal died (a son of Bell’s), at the age of twenty-eight. When it died “he wid thocht naething aboot it -had it been an auld beast.” The pet lamb has also died. This is a man equal to the ago he has lived in. He could do anything. The pleughs and carts were ” his ain mak’.” The cart ropes were made fraes his horses’ tails. He ban’ his nowte and his kye wi’ the woodie (birch) and the plough traces were woodie tae. His rapes for the cornyard and other purposes were made frae heather. Truly he is o’ the auls schule. 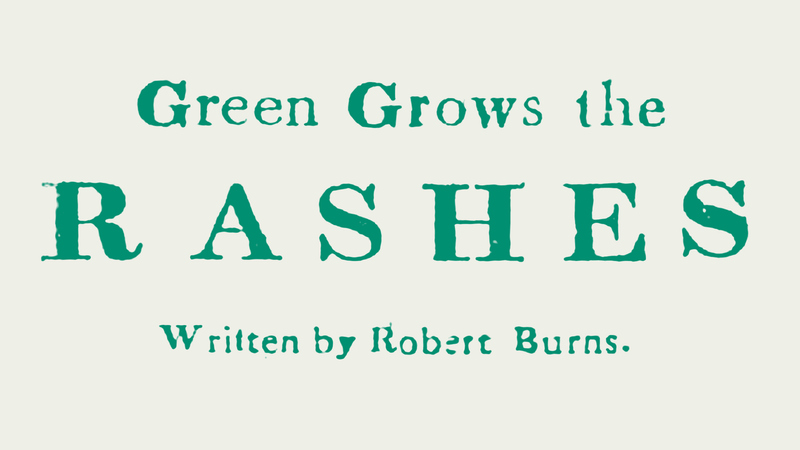 He at one time bought a turnip sowing machine, and when he got it hame he widnae use it, and threw it at a dyke-side, as “he had nae confidence in that new-fangled things at a’,” and took to his ain hame-made hand box, which is of a rather primitive construction. The same notion applies to the time o’ day. It only since the old man got “Isa” to be housekeeper that a timepiece has been procured, which is for her own use. Previous to this there was never a “tick-tock” or any other indicator of the fleeting moments “anower the door” of this Hielan’ hame. Our subject measures the time by the sun and the stars, and gives it as correct as any of “Russell’s war-ranted timekeepers” sold by the aid of the Weekly News. The licht o’ the nicht at Rashie used to the auld smith-made cruisie and hame-made tallo can’le. But Isa’ here again has made an innovation. There is now what is called by him a “white iron cruisie, wi’ a glass tap”—a paraffin lamp. “It gi’es a tine licht.” To mention relics of a past rebellious age, we will notice an auld flint gun, whit “did grand service in the reign of Quid Quest Anne.” The receipt of the purchase of this curiosity is in the hands of the owner of this defensive article. In the house there is still a good man “auld ware.” Curious but freen’ly neebours an callers have got a good few of them freely from the auld carle as mementoes of his illustrious family. His grandfather entered the farm of Hillside, Glenquiech, in 1763, and the document granting the lease is still in Rashie’s possession. The Ferntosh Charter, by which so many people could brew without a license, was then in force, and his grandfather brewed the Laird of Inshewan’s ale and whisky. The rent payable to the Laird of his grandfather’s farm was 10s and two bolls of meal per annum. The lease of this holding terrains about 1785. Twenty-one years’ leases were in vogue then, but fourteen is now the rule. His grandfather died at Horniehaugh. In connection with the brewing industry referred to in the Charter it appears it had been sold to the nation by Duke of Athole for £40,000. Dauvit’s grandsire, acting under the privileges it conferred, had brewed for twenty-one years at the Hillside, and had everything in preparation for restarting his of trade when the gauger made his appearance on morning and told him “it wit’na dae,” and put a stop to his operations. When young he was regaled with float whey and potatoes. The potatoes were boiled in large copper boiler, and the dinner table was of “green velvet” before the door. The tattles were emptied in a tattie riddle, and the family, to use a much-hackneyed picnic phrase, “did ample justice to the viands.” It is not necessary, and we deem it prudent not to follow out young Dauvit’s boy and young-manhood by going over the years of his hardship, but we shall give a few instances of the brighter side of his existence. Being possessed of a keen intellect and good perception, he soon put himself above the generally accepted term of average ability. Notwithstanding the fact of being only one year at school out of a life of 92 years, he will converse on any given subject. There is not a country in the world but he will to the extent of it to an acre. Always living among the Grampians, he has become an accepted weather prophet of great knowledge, and truly his, forecasts have been often true, which has gained for himself a celebrity among the Braes o’ Angus superior to Moore or Zadkiel. His latest observation and forecast is, judging from the present position of the celestial bodies, that either this winter or the winter of 1889 and ’90 will be as severe as in 1814, when there was an ox roasted on the ice in the middle of the Thames at London. The frost that year penetrated into the surface of the earth more than a foot, and frosted all the potatoes in the pits, whereby they were rendered useless. In his experience of four-score-and-ten years, his observations have led him to think that such will be the fact, and he maintains that “we have had caulder and hotter summers and will ever mair hae,” meaning that there is no changing of our climate, and that our seasons are much the same as those of his youth. In concluding this detached sketch of one who passed the 92nd milestone of his being while the last issue of the Weekly News was being run off we wish to mention the names of those who were members of this now nearly extinct family. These were four in number —David, the eldest; Annie, James and Jean. Jean died some thirteen years ago; James four years ago; Annie died a year past in February. When Annie, James, and David were all alive, their united ages were 253 years. There were none of them married. Annie before she died was so frail that the two blethers had to give, her an arm each to help her to the byre to milk “crummie”. Dauvit is now cared fur by the housekeeper, and likewise much under the hospitable and kind-hearted farmer of Horniehaugh Mr James Gracie, who works his croft, and, like the Laird of Inshewan. gives him every attention gratis. There is a race between tenant and laird. Dauvit is in his 93rd year and the laird is 94. Every man has a history worth knowing, such is “Rashiebog’s”. Friday 18th January 1889, Dundee Courier. 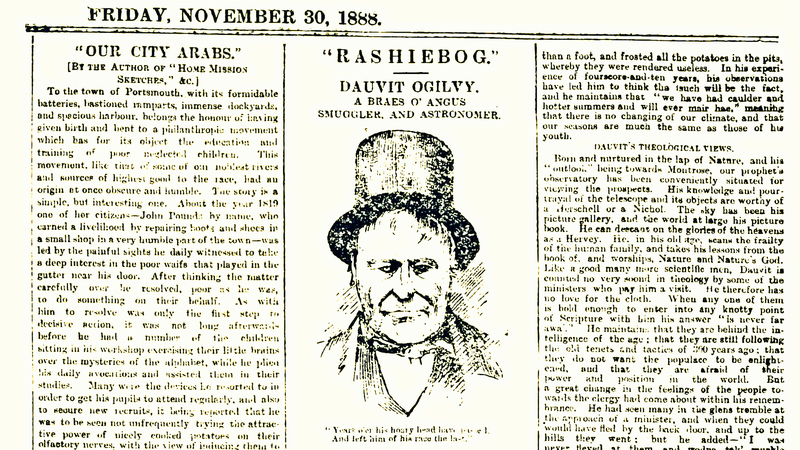 On Thursday night a concert for the beneﬁt of David Ogilvy, “Rashiebog,” a sketch of whom appeared recently in the Weekly News, came off in the Schoolroom at Memus, and proved a great success. The concert had been arranged for by a Committee of gentlemen interested in the old man’s welfare, and who have also got up a subscription list in his behalf. We are sure that their efforts will be rewarded with the success which they deserve, and that “Rashie,” who is now in his 93rd year, and whose means have become exhausted, will thus be enabled to end his days in comfort. He has too much of the “auld warl’” independence about him to think of accepting parochial relief, and the kindly consideration which has been shown towards him is worthy of the highest commendation. To such a one might they not say, and hope that it would be said to him hereafter—“Well done, good and faithful servant?” He was with them as if he were a visitor from another age, and certainly.in his quaint dress and antique appearance, he looked old enough, and carried with him memories and traditions of the past sufﬁcient to delight the staunchest Tory in their midst. (Applause). W. Black, J. Jack, and W. Howe, Kirriemuir, and the Misses Thow, Turfachie. Mr Robert Miller, Foreside of Cairn, gave a brief, interesting, and amusing historical account of Inshewan. The whole proceeding passed off without a hitch, much of that success being due to the energetic and hearty manner in which Mr Cowpar, bank agent, the Secretary of the Committee, entered into the movement. It may be mentioned that among those who have already subscribed to the beneﬁt fund are the Earl of Airlie, Miss Lyell, Shielhill; Mr John Ogilvie of Harecraig, Mrs Ogilvy, Clova; Mr Forrest, Easter Ogil ; Mr Hugh Lyon of Glenogil, the Misses Lyon and Dr Lawrence, Cumnock etc..
DAUVIT OGILVY: A BRAES OF ANGUS GENEALOGIST, ASTRONOMER, AND SMUGGLER. In the earlier part of last year there pawed over to the great majority, at Rashiebog, in the Braes of Angus, in his ninety-sixth year, David Ogilvy, a man who, although during all his long life in humble circumstances, was yet in many respects different from the majority of the people among whom be mixed. 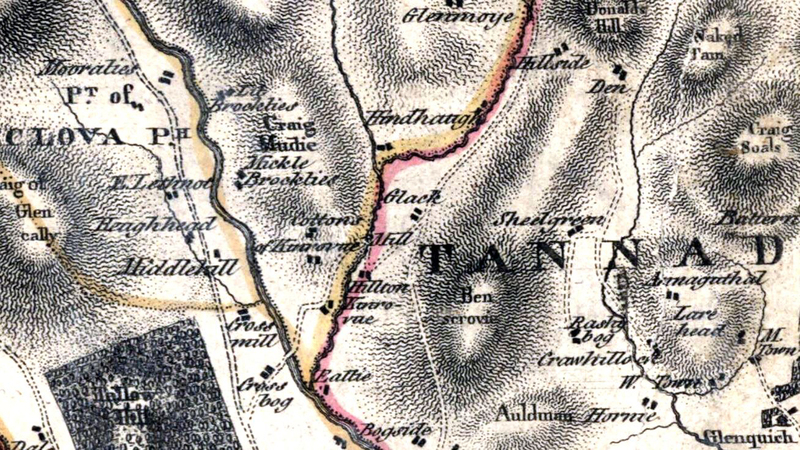 In 1680 Dauvit’s great-grandfather held lands and grazings in Lintrathen, being a large farmer and grazier, and afterwards held the tarn and grazing of Braedownie, in Glen Clova. 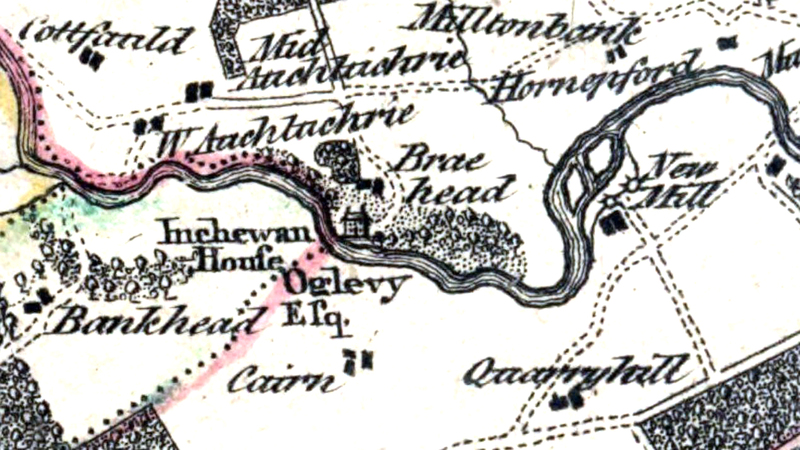 Dauvit’s grandfather leased the farm of Hillside, in Glenquiech in 1763. The document granting the lease was in Dauvit’s possession. The Ferintosh charter, by which so many people could brew without a license, was then in force, and the tenant of Hillside brewed ale and distilled whisky for the laird of Inshewan. The rent of the whole farm was 10s and two bolls of meal per annum, and the lease which was for 21 years, expired about 1785. For 21 years Dauvit’s grandsire had brewed and distilled at Hillside, and after leaving that farm he thought there could be no harm in resuming his old occupation. The law had, however, changed, the Duke of Athole having sold the Ferintosh charter to the Government for £40,000. Unaware of or unheeding this, old Mr Ogilvy had everything prepared for a fresh start, when one morning the gauger put in an appearance, and told him he must either stop any such proceedings or pay the penalty of the law. It does not appear that this scion of the Ogilvy family further persisted in illicit distillation, as by this time he was a pretty old man. Dauvit was the eldest of the family, and had two sisters and a brother. In 1805 the family came to Rashiebog, Dauvit being then little more than eight years old. At the age of ten he had ten years’ growth of hair cut, and a bonnet put on his head for the first time. It is doubtful if he would even have been so early subjected to these reforms, had it not behoved him to go to school. His first school was Craigie, near Cortachy, which he attended for the very limited period of two months. After that period of tuition, he followed the plough for a time, but, leaving the “fremit,” he returned home and attended the school of Sheilgreen alternately with his sister Jean. It will thus be seen that Dauvit did not get a classical education; in fact, it is doubtful if he got the length of the three R’s. A twelvemonth would have covered the whole of the time which be attended school, his education being rather attained in the school of experience. If Dauvit’s schooling was meagre, his dietary was also simple, float, whey and potatoes forming the staple food. The potatoes were boiled “in their jackets” in large copper boiler, dished in a “tattie riddle,” and tabled on the verdant carpet of green in front of the door. 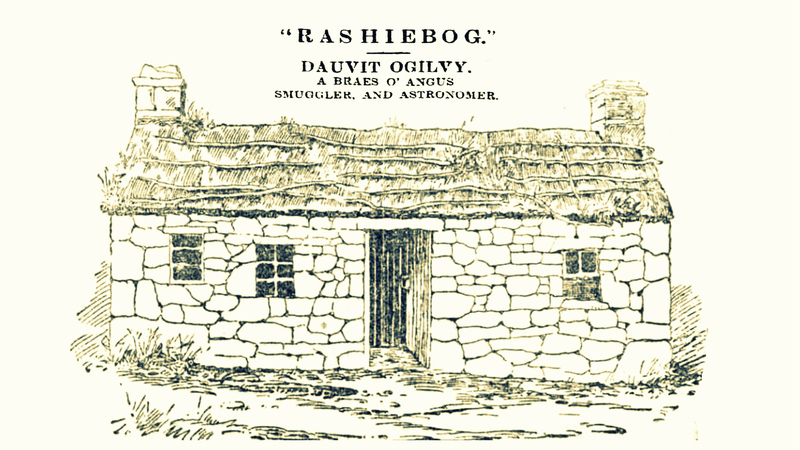 At the time the Ogilvy entered Rashiebog 1805 they paid £9 rental, the previous tenant having only paid £2. The holding amounted be 100 acres Scots, including rough pasturage, and the stock consisted of twenty ewes, two cattle, and one horse. The rental was, as we have said, during the first lessee £9, during the second £15, the third £19, and latterly from year to year at £30. These frequent rises in rent were largely due to the improvements wrought by the Ogilvys themselves. They built, fenced, drained, improved, and reclaimed, until at last the holding, which at their entrance amounted to eight acres arable, swelled to the extent of 31. All these improvements were wrought at their own expense, if we except one allowance of £30 given by their Laird, Mr Ogilvy of Inshewan. No unimportant part of the improvements was done by Dauvit himself. The house was built by Dauvit’s uncle in 1785, according to the date on the “sneck” of the door. It was built without either plumb or spirit level, just by the “sicht o’ the ee.” The fire burned in the middle of the floor, and the smoke was meant to find egress through a hole in the roof, though it availed itself of many other channels. The fireplace was however, shifted by Dauvit, and a lum made where a lum should be. The fire, however, burned on the hearth, and a cruik descended from the lum to suspend culinary utensils over the glowing peat fire. The roof was of thatch, and as the inside was destitute of ceding one could see the rafters and divots ; while without he grass, groundsel, and general vegetation helped to make it wind and watertight. The steadin” was built by Dauvit himself; but besides building his own houses he built the greater part of all the houses in the Glen. His cart-shed, henhouse, barn, byre, and joiner’s shop were all built from rough boulders and stones, some of them over a ton in weight. The whole of the fences on his 30 acres were dry stone dykes, and built by himself of whin bools taken from the arable land. The ploughs and carts were also made by himself. The cart ropes he made from his horses’ tails. His plough traces were made of withy, and he “ban” his nolt an kye with withy too. His cornyard “rapes” he manufactured from heather. Truly a genius and scion of the old school was Dauvit Ogilvy. Until increasing infirmities rendered it necessary to get “Isa” for housekeeper there was never watch or timepiece within the walls of his dwelling. “Rashiebog” could tell the time by the sun by day and the stars by night as accurately as the best chronometer. Until the advent of “Isa” a “smiddy” made cruisie, or at best a hame-made tallow dip, were used for diffusing light through his dwelling. Isa however, used a “white iron cruisie wi a gless tap,” which Dauvit was forced to admit gave a fine light. Among the many curios that graced Dauvit’s abode not the leant interesting was an old flint-lock gun which did grand service in the reign of the good Queen Anne. Dauvit could have shown the receipt for be purchase of that article. Of smuggled whisky Dauvit distilled many a gallon, and had numerous narrow escapes the gauger’s. Like many another smuggler, Dauvit thought that there was “nae sin in ‘t,” and for this belief he had several times to pay. On the last occasion on which he was taken he was fined £100, but, as he said himself, “they micht as wed has fined him a thoosend,” for he never attempted to pay it and ultimately got off for £6. Although Dauvit’s education was of the scantiest kind, the knowledge he possessed was extraordinary, and the subject could not be found on which he would not converse freely. As an astronomer be had no equal among the Brass of Angus. His keen perception and intellect, combined with careful observation, made him able to give forecasts of the approaching weather, the general accuracy of which gained for them a better reception in the surrounding neighbourhood than those of the Meteorological Office. When Dauvit gave up his farm it was leased by Mr Gracie of Horniehaugh, at a rental of £40, Dauvit, however, retaining the houses, and five acres of land. Mr Ogilvy allowed his old tenant this croft at a rent of £5, at the same time intimating that he would allow a reduction of 100 per cent. A rare old pair were laird and tenant, for when Dauvit was 93 the laird was 94. Dauvit was very kindly treated by his neighbours, who rendered him every attention in his declining years. His croft was always wrought gratis by Mr Gracie, and his stock latterly consisted of a cow, a stirk, a pig, and a few hens. Dauvit Ogilvy was the eldest of his family, the others being Anne, James, and Jean. Jean died about seventeen years ago, James about eight years ago, and Anne about six years ago. Thus the oldest brother survived the whole family, and proved the last of his race, as none of them ever married. Annie, who kept house to her brothers, was latterly so frail that they had to take each an arm to assist her to the byre to milk the cow. When David, James, and Annie were all alive, their united ages amounted to 253 years. Dauvit has now followed his kindred to the grave, and with his death has terminated a line of the duni-wassels of the Clan Ogilvy.